With hydro rates only increasing, one thing on the mind of many hot tub owners is how to save money on the running costs of their hot tub. New hot tubs are becoming more energy efficient every year, but older or improperly set-up hot tubs can still end up costing quite a bit to maintain. With that in mind, here are 9 ways you can make your hot tub more energy efficient and reduce your running costs. When new, most hot tubs are fairly well insulated. Over time however, spray foam insulation commonly found in hot tubs can become waterlogged and lose its effectiveness. Foam insulation works by trapping heat in the air bubbles that make up the insulation. While air is a great insulator, water is not. If the foam gets wet and those air bubbles fill with water, the insulation loses most of its effectiveness. If you notice a leak in your hot tub be sure to have it fixed as soon as possible. Even minor leaks can, over time, cause your hot tub to lose a ton of insulating value by slowly saturating its insulation. Not only that, every time you top up the hot tub water you replaced water you’ve already paid to heat with cold water that will now have to be heated. Once the leak has been fixed, be sure to remove all the wet foam and replace it with fresh, dry insulation. Old hot tub covers are often the largest source of heat loss for hot tubs. Much like hot tubs themselves, hot tub covers utilize foam to provide insulation. This foam is covered in a plastic vapour barrier that prevents it from becoming waterlogged by the water in the hot tub. Over time, the cover will begin to take on water as the vapour barrier slowly break down. Wet foam in hot tub covers is just as useless as wet foam in hot tub insulation. You will know your cover is starting to take on water when it begins to fell heavier than normal. This added weight is water that is trapped in the foam. 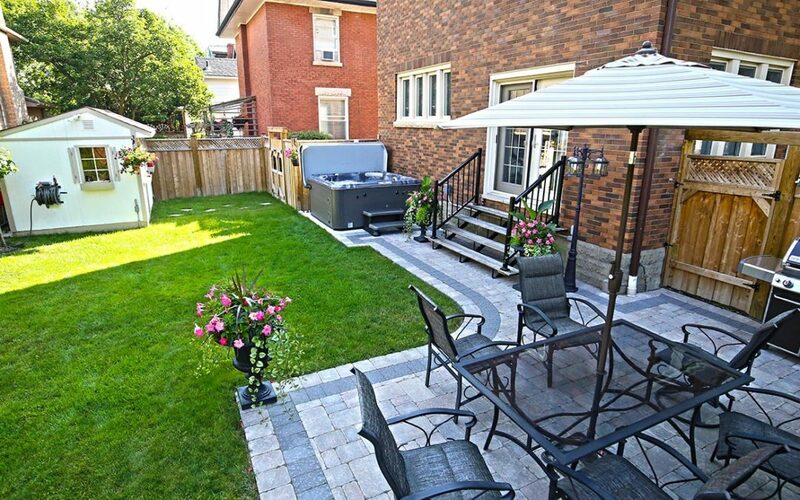 You should consider buying a new cover as soon as you notice a significant change in the weight of your hot tub cover. When purchasing a new hot tub cover, make sure it has a “full foam seal”. This is an added piece of foam that insulates between the two halves of the hot tub cover when the cover is closed. Without a full foam sealer, hot tub covers typically only come with two small pieces of foam on either end. These are useful for preventing evaporation but leave a uninsulated gap between the two halves of the cover. One of the easiest ways to save on the energy costs of your hot tub is to program its filtration cycles. All hot tubs need to filter their water to get rid of contaminants and keep the water clear and safe to use. To do this requires one of the pumps to turn on and cycle the water through the filter for multiple hours per day. This adds up to a significant part of the monthly hydro cost of a hot tub. Fortunately, most newer hot tubs allow for some degree of control over their filtration, although they do this in different ways. Consult your hot tub’s owners manual to see exactly how to program yours. Once you know how to change your filtration cycles, program them to run during off-peak or mid-peak hours to spend less without sacrificing water quality. To maximize your savings some hot tubs, like Hydropool’s Self Cleaning hot tubs, even allow you to program different run times on different days. Use this to run your hot tub less on days where you don’t typically use the hot tub. Some hot tubs, like Hydropool Self-Cleaning hot tubs, have built in programs that allow you to adjust how your hot tub runs on a day by day basis. As an example of this let’s say that you typically only use your hot tub on weekends. In this case, your hot tub will not need to run as long Monday-Thursday as it will Friday-Sunday. This is because there are far less contaminants being introduced and therefore less contaminants that need to be filtered out. In this scenario you could get away with running your filtration for 4 hours a day, rather than the typical 8-12 hours. If you’re going on vacation, or just won’t be using it for a while, check to see if your hot tub can be set to “economy mode”. Economy mode differs from standard mode in the way that it heats the hot tub. Rather than heating the water consistently to maintain your set temperature, economy mode will only heat the water during your scheduled filtration times. Simply put, economy mode reduces your hot tub energy costs by running your heater less. The downside of economy mode is temperature fluctuation. Since the heater isn’t running for long periods of time, the water temperature can vary quite a bit. This makes it less than ideal if you are planning on using the hot tub. For this reason, it’s best to only run economy mode when you’re not going to be home for 2-3 days or more. 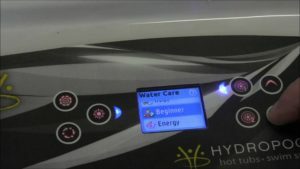 Some hot tubs, like Hydropool’s Self-Cleaning hot tubs, even have preset programs that can automatically switch between economy mode and standard mode. These programs are useful if you’re gone for a few days but want to use your hot tub when you get back, or are going on vacation. Most modern hot tubs are very well insulated. That being said, you can generally still do better. Adding insulation around the cabinet of your hot tub allows you both to trap the waste heat created by the pumps and heater and help protect the pumps and heater in case of a power outage. While this can add to the energy efficiency of the hot tub, don’t completely stuff the hot tub with insulation. Keep in mind that the pumps need air to cool themselves, if they don’t get enough fresh air they can overheat and potentially break. Leave any cabinet vents unobstructed and remove any added insulation in the summer to avoid this. Canadian made Hydropool hot tubs take care of this for you. Not only do they insulate both the shell and the cabinet of the hot tub, Hydropool also include variable vents. These vents allow you to add fresh air in the summer to protect your pumps and seal them up in the winter for maximum energy efficiency. 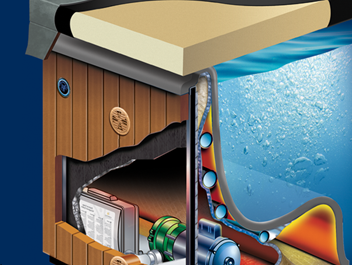 Hydropool’s unique insulation system insulates both the shell and the cabinet of the hot tub for maximum energy efficiency. Slowing evaporation. A significant amount of the overall heat loss in well insulated hot tubs comes from evaporation. Regularly clean or replace your dirty hot tub filters. Water cannot pass through a dirty filter as easily as it can through a clean filter. This means that the pumps have to work harder in order to properly filter the water. For that reason, constantly pulling water through a dirty filter will reduce the life of your pump. To keep your filters clean, remove them once every 1-2 weeks and put them under running water to clean off large dirt and debris. Over time, oils and lotions also build up on filters. To clean off these oils and lotions, clean your filter in a chemical solution every 3-4 months. Cleaning only goes so far though and your filter should be replaced once per year. Your hot tub’s air controls should be shut off when you’re not using the hot tub. The air that these controls ad will cool down the water, causing your heater to work more to compensate. The added air also slowly increases your pH, meaning you will have to add more chemicals to compensate. Make sure to lock your cover when not using your hot tub. The cover lock clips help to keep the cover firmly closed. Unlocked hot tub covers can be lifted by the wind or, if your air controls are left open, from positive air pressure building up under the cover. This allows heat to escape and increases evaporation. If your cover lock clips are broken, replacements can be purchased. One of the easiest, and best, ways to spend less to run your hot tub is simply to lower the temperature of the water. Depending on the outside temperature, lowering the temperature of your hot tub water by 1 degree can lower your energy bill by up 10-15%. This does not mean that you should be constantly changing your hot tub temperature though. Often times, the cost of heating the water back up to temperature can be more than what you saved by lowering the temperature in the first place. Instead, try using your hot tub 1-2 degrees cooler than you normally would. While buying a new hot tub is still the best way to ensure you’re spending as little as possible to run your hot tub, it’s not always practical to do so. As you can see there are ways to save money with your existing hot tub. Small things like lowering your temperature of the water or reprogramming your hot tub’s filtration can make a large difference on your energy bill.